I've started a camping group for North Phoenix Buggy people. If you are not from North Phoenix that is ok too but we are trying to find people up in this area. We are going to organize activities for Desert Buggy Riders. If you are interested in joining, look up our group at "az off-road 2x4" on Facebook. 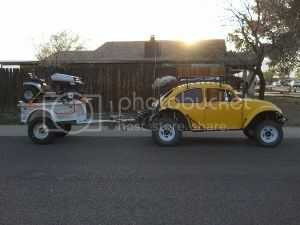 i am mostly looking for people with desert style buggies 2 wheel drive vw based type cars. However most will be welcome in this group. We will welcome SxS, prerunners, trucks, Jeeps, truggies and any other cool off-road vehicles that are safe to the people riding and to the desert they are in. We enjoy exploring the desert. Some fast paced. We do runs to Crown King, Wickenburg , Four peaks. And in the summer months head north to Flagstaff area for some more fun. I enjoy finding new places. That is part of the excitement of exploring. We are a pretty laid back group and want to remain that way. We are a family group. We are out there to have good, respectable fun. The desert is a large place but it seams to be getting smaller due to the closers that are happening everywhere. We believe that is partly due to the few bad apples that have joined this sport and do not respect the desert or the other people that are out there. We play mostly Country music and maybe some of the good Hippity Hop music. At a low enough volume that we can tell fish stories around the fire and pass along a fun experience to the next generation of desert campers. We try to find kid friendly places to camp. Places that have motorcycle jumps and berms so we can set up cones and jumps so that our kids can enjoy their dirt bike's and quads near camp. We have kids of all ages. Some of the people in our group just stay at camp and watch the kids rip around while we take turns heading out for trail rides in the buggies. We will be setting up rides camping trips and desert clean up parties (if we find a place that is trashed). I am also looking for fun stuff around town like swap meets and Air shows that are fun to walk around and check stuff out. I will post what i can find. If you find something send me a link to it or start an event and one of the moderators will get it approved. My goal is to find fun stuff to do a couple times a month. We are a desert group. Not much sand stuff. There are plenty of those groups out there. Look us up if you want a safe place to play with other experienced off-roaders. Rule 1 nobody gets left behind. Rule 7 Have more fun. If you are a 20something and want to have a raging bonfire with Five Finger Death Punch crackling out of your speakers and shotgun beers until you pass out this is not the group for you. We do not want drama. We do not want cocky people. We do not want fights. You will be blocked from the group if you can not respect regular social standards. Sounds like a good bunch of people! looking forward to seeing you out in the desert. I'll check out your FB page thanks. Rigger...are you coming back out to box canyon?